"Mama, aren't you glad I helped you?" I stopped to survey my daughter and the state of my counter as well. She had peach juice running down her chin, down her arms and elbows, all over her mouth, and covering her entire outfit. There was peach juice running down my countertop, down the front of my dish-washer, and laying in a big puddle on my floor. The chair Cosette was standing on was also covered in peach juice. I think that 99.9 % of the peaches she had helped me to take the skin off of had actually ended up in her tummy, not in the bowl. We had begun this task with the idea that she would help me pull the skin off of the peaches to cut up, put in bags, and store in the freezer. But now I had an extra huge mess to clean up. But then, I looked at Cosette. She was so happy! Her tongue was still busy licking the remaining juice off of her lips. There is nothing like a sweet summer peach! So, I gave my daughter a kiss, thanked her for helping Mommy so well, and stripped the sticky peach clothes off of her equally sticky body. And I wondered to myself "Where would I be without my little helper?" So, I'm sitting here once again at almost midnight, wide awake. "Why?" you ask. Because of this crazy medicine I'm on. Again. For my ears? Nope. My ears are just a prayer in the heart of God right now, which I'm leaving in His hands. Nope, this is entirely different--I have pleurisy. What, might you ask, is that? An infection in the lungs/chest cavity that could develop into something worse, like pneumonia, if not treated. Where did I get it? Who knows! The doctor told me this, and I wanted to yell '' I thought I was a healthy 24 year old!!!" Apparently not! At least not right now, that is. Anyway, it's not a huge issue, I just have to take this crazy medicine again.....yep, the same stuff I was on for my ears. (But hey, maybe it'll pop my ears open this time, right? ;) It is NOT nice stuff! The first day I took it, I was knocked out on the couch all evening. I felt like I had the flu. My neck hurt! My legs hurt. I was sick on my stomach. Then I felt like I was on drugs! (which, essentially I guess I was...) I had the nervous jitters. I was exhausted, but I couldn't sit still. I paced around the yard for twenty minutes trying to get rid of my 'jitters'. Finally, I fell asleep all curled up in a ball on Joel's side of the bed. That was Saturday. This is almost Tuesday, and I've barely slept since then. Apparently, first this medicine knocks you out, and then it wires you up! I think I only slept two hours last night, and now here I am again, wide awake at midnight. *Sigh! * I'm beginning to think the pleurisy itself may have been better than all of this....or maybe not. So, I'll stop complaining now. Just pray for me folks! I am getting really sick of having to update you all on all of my personal prayer requests! Pray that this medicine takes care of my sickness, and I find myself healthy and happy again in six days! (When the medicine is finally done) And pray that this medicine makes it way back out of my system very quickly! And please, please, pray that I'll get sleepy soon! Steve Martin in "Father of the Bride"
And now, I'm finally feeling sleepy and you are probably bored out of your mind, so adios! finding something new to explore or get into. However, they will sit still to read a good book. In this picture, they are sitting with our friend Adam. around so she looked like a dog with a flappy jaw line. Eli has been doing so many things lately that amaze me. I can't believe he is (or was) my little baby! Like today when I lifted him to the sink to wash his hands, he actually rubbed them together! He didn't grab the soap container or the sink stopper like he normally does. It's like it finally clicked for him "Oh yeah, this is where I rub my hands together!" He has also been trying to say words to me so badly! He will come running down the hall, point at something, look at me, and give me a whole mouthful of stuff that I can tell means something to him. Bother! Sometimes he gets an actual word in there, like 'more', or 'mama', or 'daddy', but that's about it so far. Lately, whenever he hurts himself, he'll run to me crying, and then rub his head. Never mind that it's actually his arm or his leg that was hurt--rubbing his head seems to be his way of telling me that he has an ouchie! He is into hiding his sippy cup. I hunted for it all day the other day, and finally found it in our linen closet. The linen closet!! I currently don't know where it is again---probably somewhere with milk in it, souring. Let's hope I find it before he does! This morning after changing his diaper I picked him up and kissed him on his cheek. He grinned so sweetly, and then reached up and kissed me back on my cheek! I thought I would melt. He is the cuddliest, sweetest little thing. I know one day he'll be a tough little man, chopping wood with his daddy and looking out for his big sister----but for now, I'm enjoying my sweet baby boy. My little corner of the world. The place where I spend a large percentage of my time. I remember the time Joel tried to use a new ice cream scoop, and it split in two, sending the entire tub of ice cream flying across the kitchen table and onto the floor. Oh, how we laughed! I remember after we first moved in, our house had been empty for more than a year. Joel spent one evening chasing a flying squirrel around our kitchen, trying to get it out the front door! I remember my little guy discovering himself in the oven door for the first time and giving me a huge grin. "Look Mama, another little boy!" I remember my little girl climbing up on a chair beside me for the first time and saying "Mama, I can help! Let me stir!" My husband drove around alot today to do jobs and estimates for people. Then, he worked all afternoon in the office, preparing more jobs and doing.......well, all the work that I know nothing about! 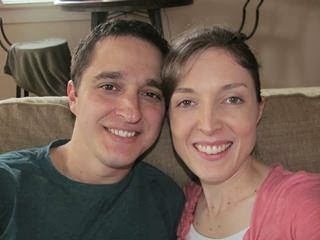 Then, he made sure he made it home on time to eat dinner with us, clean up dinner, and go grocery shopping. He is so generous to go grocery shopping with us whenever he can.....I have done it by myself before, but it's not easy driving a half hour to the store, pushing a huge cart with a miniature car on the front of it for your two year old to ride in, trying to concentrate on the grocery order....at any rate, we're always glad to have Joel around to help! On arriving home, I put the groceries away, and Joel proceded to get the kids ready for bed--- brushing teeth, getting on pajamas, reading Bible stories, singing the good-night song, the whole nine yards. My poor tired husband finally got to sit down a little while ago and read a book. I'm amazed that he is actually still awake after all of that! So, my love, even if you don't always realize it, I really appreciate everything you do around here.........you really are my hero! Yesterday we were at a family reunion. Cosette was sitting with my parents eating her lunch. She looked up at my dad and said "Pappy, I really like this melon water! " Tonight during our Sunday Evening snack, I mentioned that the flower in the middle of our table had died. Cosette said "Oh, Mommy, that makes me sad! I'm sad about that flower!" She did look genuinely distressed, so I tried to change the subject. "Do you want more popcorn, Cosette?" She replied "Oh yes, Mommy, that would make me feel happy again! " I am so proud of my sister! She recently hosted a Secret Keeper Girls Conference in our area. 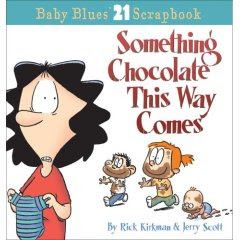 If you're not familiar with this, it was originally a book written by Dannah Gresh. It has now grown into more books, study guides, tour/conference, etc. Anyway, the main idea of the conference is teaching young ladies, ages 8-12, along with their moms, how to live godly lives in a society that is pulling them every other direction. They talked to them about many different things, including resisting peer pressure, having a good relationship with your mom, and how to dress modestly. The conference was extremely well done. The people who did it were energetic, fun, and really spoke to the girls from their heart. I was really proud of my sister, as it took alot of work on her part to pull everything together to get the conference here! If you have any girls this age, I would highly recommend that you check out their web page and see if there are any conferences coming to your area. "Somebody help! She's got me!" maybe they've still got me!" I love to read a good book, especially at night when everyone is asleep and the house is quiet. I probably stay up way too late reading most times! I find it to be an encouraging way to end my day and go to bed with a good attitude and perspective. I thought I'd share a few of my favorite books with you here. Some of them I've read over and over, some of them I'm reading for the first time. 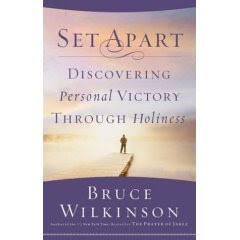 "Set Apart", by Bruce Wilkinson. I am actually still reading this one, but so far it's been great. A very helpful book for anyone who seeks to be holy, but wonders how in the world to accomplish it. Joel actually had the privilage of meeting the author and talking with him when he was in ministry in Indianapolis. "To Train up a Child", by Michael and Debi Pearl. 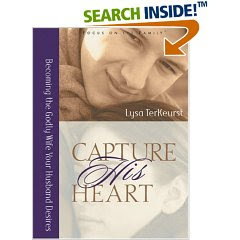 Yep, another pearl book :) The information in this book has been so useful in training my children for the Lord. 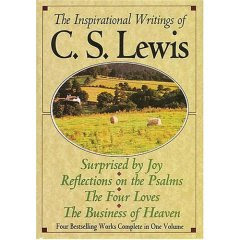 "The Inspirational Writings of C.S. Lewis" This has been one of my favorites for a while now. Just plain encouraging at the end of a hard day! "I'm having a wedding, Mommy!" Yesterday was a strange day. I felt like my brain was frozen the entire day. Ever have days like that? I tried for hours to get out the door to the grocery store....only to realize that by that time, it was lunch-time, and the kids were missing their morning naps! NOT a good time to try to get groceries! I didn't end up making it to the store until Joel got home, and that was like my only accomplishment for the entire day! My washer is humming, meaning that I've actually started some laundry. My dinner is waiting in the fridge, ready to be put into the oven later. Oh, and I think I may have figured out what is wrong with my ears! I did some extensive research, and I'm fairly certain that all that is wrong is a clogged Eustachian tube. All of my causes/symptoms fit this description perfectly. The specialist I recently went to had mentioned this as a possibility, but was unsure what to do about it. Well, if that is really what is wrong, the good news is that either 1.) It will clear up on it's own over time, or, 2.) There are different procedures that doctors can do to correct the problem. The internet says that it generally happens after an ear infection or bad head cold--which is right around the time I started to notice it. So, all in all, if this is really what's wrong with my ears---this is great news!!!! It could mean that the hearing loss I've suffered is only temporary, which would be a HUGE answer to my prayers! Please keep praying for me so I will know what steps to take next. So, that has been my day so far. I am so glad that after weird days like yesterday, God gives us days to rejoice in! 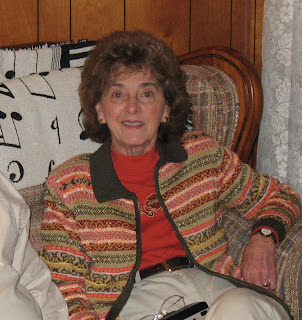 "Chin up, child, tomorrow will be better, and I am already there....."
This is a picture of my Grandma (one of them, at least, I have several grandma's and great-grandma's still living.) This picture was taken around Christmas time. My Grandma has been offering for a while now to come up to my house and help me clean. Well, this past week, I finally decided to take her up on the offer. Now, I pride myself in usually keeping a fairly clean, organized house. But when grandma got here this morning, it was anything but clean! Never fear, she set right to work! My grandmother is the best house-keeper you have ever met. She cleaned my house from top to bottom in no time flat. She even cleaned places that I tend to neglect---like my pantry shelves, behind the books on the bookshelf, the front of the fridge, the sugar and flour canisters---you name it, it's clean! This was such a blessing to me. Especially since we have a busy week ahead of us helping out with VBS at our church. So thanks Grandma, you're the best! And now, on to my second thought, which stems from my above paragraph. I read an article recently, I can't remember where, that stated that today's stay at home mom probably has a more difficult time than those in the past did. Why? Because in the past, most moms stayed at home. There was a strong sense of 'community' within family and church. Women 'hung out' together all the time! They baked bread together, the had quilting bees, they helped out when a friend was sick, they spent days canning food together. They had plenty of time during all of this for talking and fellowshiping. Five years ago, I would have thought this idea was crazy. But, I have seen it lived out through Joel's Mom's family. Most of Joel's family on his mom's side are Mennonite. And the women love being stay at home moms! They encourage each other, they take pride in raising their children, they help each other out with larger house-hold duties like canning. When a new baby is born, there is no end to the supply of fresh home-made bread and dinners waiting for the family. When Eli was born, Joel's family (the women) spent an entire day house-cleaning my house so it would be ready when the baby came! So, what am I trying to say? I have NO idea! :) Just making observations, I suppose. My grandmother's help today just made me ponder these things. What can we do today to establish more of a sense of community like I see in in-laws lives, or like I witnessed today when my grandmother helped me? Maybe it exists more than I realize! What have been your experiences with this? I am interested to find out! 1.) Ecclesiastes is the writing of a very wise king, who had much life experience. The ideas he wrote are true and to be taken literally, even though they are hard to swallow, such as 2:2 "I said of laughter-"Madness! "; and of mirth, "What does it accomplish?" Therefore, God is trying to teach us to have a proper perspective on life-- you know, the whole ' a time for ...' thing. 2.) Ecclesiastes is the writing of king Solomon near the end of his life. He is old, unhappy, and is realizing that none of his wealth or possessions will matter in the long run. Therefore, the purpose of God giving us this book is to show us that all is 'vanity' without Christ. Solomon had it all, and yet he had no happiness. Without Christ, our perspective on life would be the same. I am strongly leaning toward conclusion two, especially when I compare verses like Ecclesiastes 1:9 "......And there is nothing new under the sun." to 2 Corinthians 5:17 "Therefore, if anyone is in Christ, he is a new creation; old things have passed away; behold, all things have become new. ready to take to the recycling center. Daddy: Cosette, I think we have a ground hog living in our back yard. Cosette: In our own backyard!? Cosette:Yeah, he lives there with his couch and his bed and his piano.